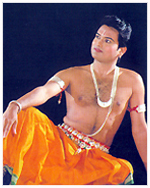 Dynamism, charisma and astounding talent makes Guru Smt. Aruna Mohanty one of the finest Odissi Dancers in the field of Odissi Dance. Smt Mohanty has always defied stereotyping. Her perception of dance and choreography is unconventional. 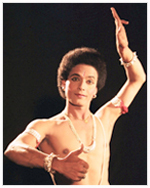 Yet, she has been vehemently careful about preserving the basic structure and aesthetics of her beloved art form Odissi. Aruna has considered dance to be the essence of her soul. The rhythm in her feet connects her to a divine force. The perfect blend of bhava, bhangi, taala and abhinaya radiate from her performances. She was trained and nurtured under the able guidance of Padmashree Guru Gangadhar Pradhan. She especially excels in the abhinaya aspect of Odissi. Beginning first as a student of the Orissa Dance Academy(ODA), she has grown into a respected performer, teacher, choreographer and administrator. She has received many awards and accolades for her contribution to the arts, including the Mahari Award (1997), Sanjukta Panigrahi Memorial National Award (2001), Fellowship by Ministry of HRD, Government of India, and the prestigious Sangeet Natak Akademi Puraskar Award in 2010. She is not only an eloquent dancer and performer. 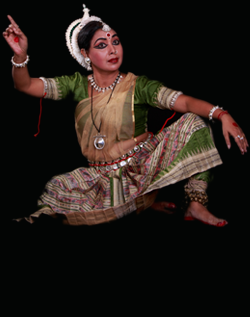 She has also has tremendous knowledge about the evolution of Odissi as a distinct art form in India. Thus she combines extensive research, lessons from her Guru, and innovative thinking to produce provocative choreography. Some of the items in her repertoire include the dance ballet ‘Shrusti O Pralay’, ‘Varsha-Abhisara’, ‘Sravana Kumar’, ‘Kharavela’ , ‘Jatra Baramasi’, ‘Gatha Odishi’, ‘Krupa Nidhaana’, ‘Swargadapi Gariyasi’, ‘ Arjuna Dui Adhyaya’, ‘Pratinayak’, ‘Krishna Sharanam’, ‘Pratinayaka’ and ‘Khamaj Pallavi. She has traveled travelled all over the globe to present solo and group presentations in addition to workshops and lecture demonstrations. She was a member of Central Sangeet Natak Akademi, New Delhi and currently serves as the vice president of the Odisha Sangeet Natak Akademi.